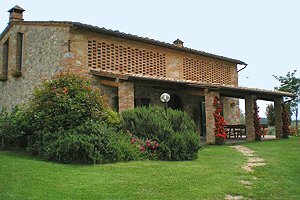 The villa is an old peasant house situated in Monteroni d`Arbia (Siena), in the Crete Senesi region. 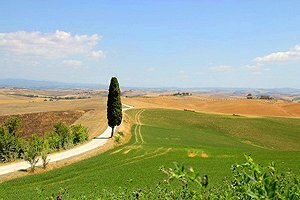 Immersed in the picturesque Tuscan countryside, the villa is the ideal accommodation for groups of friends, families and couples who dream of relaxing vacations at the discovery of important cities of art, such as Montepulciano, San Gimignano, Siena, Volterra, Pienza and Florence. 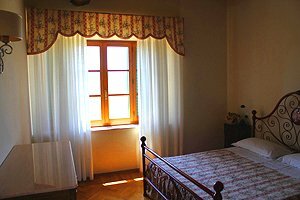 A riding stable, a tennis club and a golf club, as well as the spas of Bagno Vignoni, Rapolano Terme and Saturnia are within a few kilometres from the villa. 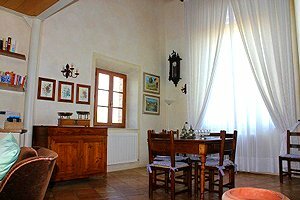 Food-and-wine lovers can take advantage of their stay at the villa to taste the cheeses, wine, extra-virgin olive oil, honey and truffles produced in the area. 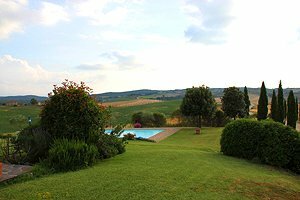 The villa has a wonderful view over the Crete Senesi region. 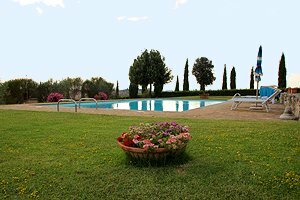 The garden and the windows of the building command Montalcino, Siena`s skyline and Mount Amiata. 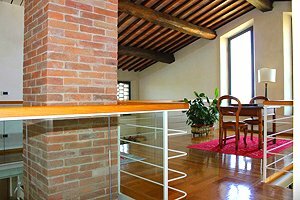 The villa is surrounded by a fully fenced garden, which is accessed through an electric gate. 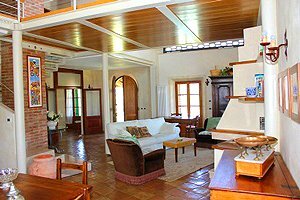 About 15 metres from the house lies the private swimming pool (7x14 m; depth: 1.00-2.00 m), equipped with sun loungers, sunshades and tables. 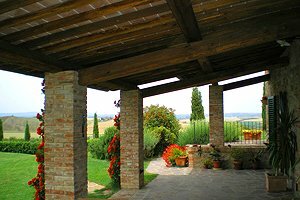 A large porch is furnished for having meals al fresco. 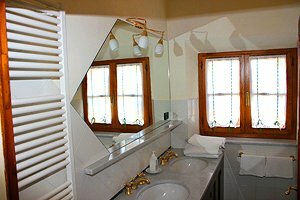 The villa is a two-storey building; it sleeps 8 people in 4 double bedrooms, and has 3 bathrooms. 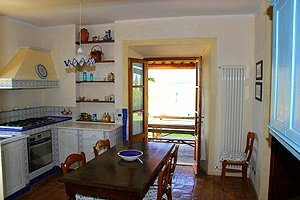 The ground floor composes of kitchen; large lounge with fireplace, living area, dining area and reading area; laundry room; a double bedroom; a bathroom with shower and double washbasin. 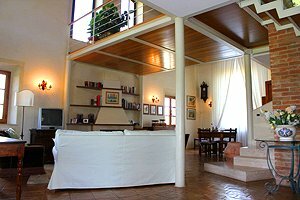 On the first floor are a living room with reading area; three double bedrooms; a bathroom with shower; a bathroom with bathtub and double washbasin. 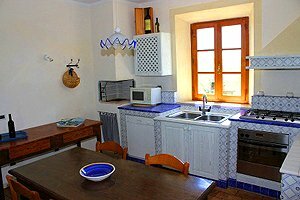 The villa is equipped with swimming pool, barbecue, working fireplace, air conditioning, Internet connection, satellite TV, oven, microwave oven, dishwasher, washing machine, iron, some mountain bikes, cot beds and private car parking place. A baby-sitter, a cook and a maid service are available upon request. 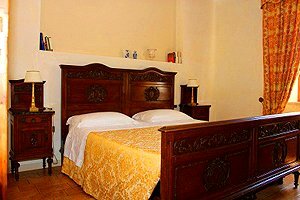 Shops and services of any kind are in Ville di Corsano, 2 kilometres from the villa. A golf club and a riding stable are 5 kilometres from the property. A tennis club is 10 kilometres from the villa. 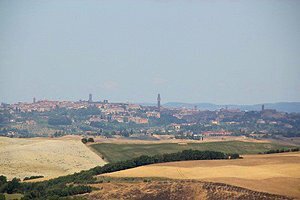 Ville di Corsano 2 km - Monteroni d`Arbia 10 km - Siena 19 km - Arezzo 74 km - Florence 80 km - Lucca 117 km - Pisa 120 km. 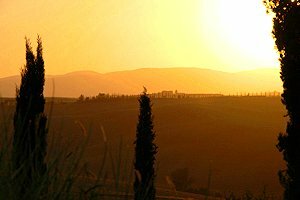 Florence airport 87 km - Pisa airport 121 km. 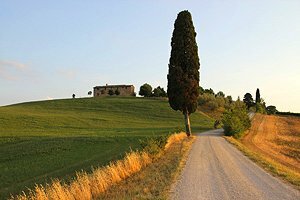 The villa is accessed through a two-kilometre well-tended and comfortably drivable dirt road. Wonderful place, beautiful views and location.